After practice and qualifying conducted with ambient temperatures in the mid-90s and track temps at times exceeding 130 degrees, TMS’ high-banked, 1.5-mile quadoval will be “green” as the green flag for the start of the 248-lap/372-miler. NBC Sports Network’s coverage is set for 8 p.m. (EDT), with the start at 8:50 p.m. The 20th edition of “America’s Original Nighttime IndyCar Series Race” will be the first contested here with all 22 cars equipped with INDYCAR-mandated domed skid plates and rear wing beam flips. A safety feature running the full underbelly of the Dallara DW12 chassis, domed skids are designed to create additional downforce and reduce the chances of a car becoming airborne in the event of a high-speed slide or spin. Meanwhile, degradation of Firestone’s latest tire compound also has drawn the attention of a field that will be led by pole-sitter Carlos Munoz of Colombia and Andretti Autosport. “I remember last year, practice was a little bit mess for everyone. I wasn’t happy with my car,” said Munoz, who bagged his first career series pole with a two-lap run Friday of 48.2460-seconds and 217.137 mph in his No. 26 Honda. “Practice seems the same. Anyone is really happy. “I run a little bit in traffic with the race balance, everything. The car feels good. But like I say, practice really different. The night, the temperatures are lower, almost no wind in the night. So that makes easier the life for everyone. James Hinchcliffe, who qualified on-pole for the 100th running of the Indianapolis 500, posted a solid 10th-place effort here in the No. 5 Schmidt Peterson Motorsports Honda. “I think the race is going to be similar to what we’ve seen here the last couple of years,” said Hinchcliffe, who qualified at 216.262 mph. “Firestone put together a package that falls off to make it a little more challenging for us, make the show a little bit better, stay away from pack racing, keep it safe. The onus is really on us as drivers and teams to make the setup as easy on tires as we can be. We need to be patient and not just go flat-out at the drop of the green or the start of a stint. Scott Dixon, the defending event champion, definitely will start up-front as Row 1 sidekick to Munoz. Dixon’s combined lap times of 48.2986-seconds at 216.901 mph will put him squarely into contention for his second oval-track victory of the 2016 season. Dixon posted a dominating performance en route to winning on the 1-mile Phoenix International Raceway on April 2. Dixon also was among a large group of drivers who tested the domed skid at Indianapolis Motor Speedway in April and at TMS in May. 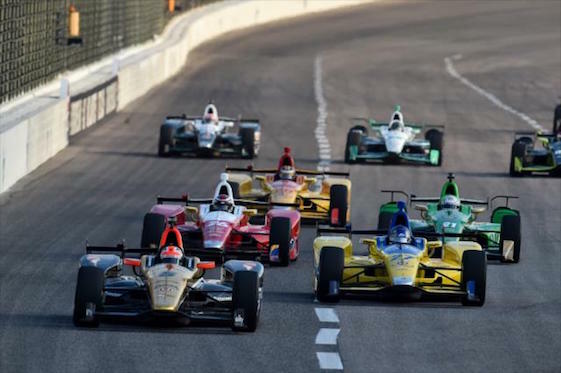 Dixon cruised to his second career victory at TMS last June in a race that established a record for the fastest Verizon IndyCar Series event in the track’s 19-year history. Dixon posted a 7.8-second margin of victory over runnerup and Target Chip Ganassi Racing teammate Tony Kanaan at a blistering average speed of 191.940 mph. That speed obliterated the previous Indy car record of 185.719 mph set by Helio Castroneves of Team Penske in 2006. “I think there’s still going to be a good amount of (tire) degradation. But that’s good for racing,” said Dixon, the four-time/reigning series champion and driver of the No. 9 TCGR Chevrolet. “I think last year had all the components to make it a really close race. It was just kind of shocking that really only three or four cars chose to run the downforce that we did, which made the cars very consistent and good on the long runs, whereas the rest of the field were quite trim and were dropping like flies sort of halfway through a stint. The domed skid, Dixon said, remains somewhat a mystery component. “I think you have to give the safety steam and everyone at INDYCAR huge credit,” Dixon said. “At Indianapolis, with crashes, there were no cars coming off the ground with the rear flap and the domed skid. That was huge for everybody involved and great to see. Big credit to them. Dixon trails championship leader Simon Pagenaud of Team Penske by 80 points, with tonight’s race officially kicking off the second half of the schedule.